I may break the vulnerability meter today. Past experiences, situations, things we aren’t proud of, feelings we wish we didn’t have – we know the true stories that make up all of who we are. And while there is plenty of joy and happiness, we’ve all experienced sadness, loss and despair. But somewhere along the way we were taught that maybe sharing all of who we are isn’t a good idea because maybe if we do, those around us won’t approve. And possibly with that belief comes the belief that without approval there is no love. I lived this first hand when I was a high school student madly in love – at least as in love as you can be as a teenager – and found out I was pregnant. Fear of being judged, ridiculed, outcast and worse, not loved, caused me to keep it a secret. I hid my pain, my truth and my growing belly out of fear of being rejected. I was wounded with the thought that another family would raise my baby. That it wasn’t my decision. Wounded with the idea that the things that used to upset me seemed trivial because life had gotten so real, so fast. Wounded with the isolation that my secret kept me in. Wounded with the thought that I was one of “those girls.” (Life lesson: you become what you judge.) Wounded with the shame that seemed to replace the air I used to breathe. Wounded with the idea that my daughter had absolutely no say in what happened. Wounded with the idea that I wouldn’t know her. This is a very big, vulnerability-inducing story I’m sharing here, I know. But that’s only because I really want to convey just how powerful sharing our truth really is. Owning our story is accepting it – every nook and cranny of what has gotten us to this point. And when we fully embody what has brought us here and are no longer ashamed or keep secrets, we embrace our whole selves. It took me many years of healing and understanding to come to this conclusion. And now my story is out there and I can appreciate all it has given me and all it has allowed me to give to myself. When we accept ourselves exactly as we are, the judgment from within is dismantled, and the approval from anyone outside of us is no longer needed. This is where healing begins and transformation takes place. We have to own it to change it. The secrets we keep because it’s too painful to speak are far more hindering than sharing our stories could ever be. Secrets lead to shame, and there’s nothing that can dampen our spirit faster than shame. I once heard that having courage feels uncomfortable, and I whole-heartedly believe it. But the temporary discomfort we may feel leads to lasting stability. When we are courageous enough to share our story and to be honest with what is happening within us we give room for others to love us, and more importantly to love ourselves. Authenticity starts with the relationship we have with ourselves. Putting words to our inner secrets loosens the grip they have on us. Speaking our truth frees us. When I collected all the courage I had and shared my story, a shift in my life occurred. A new dynamic in my life opened up and I was able to walk on a path of purpose and truth. 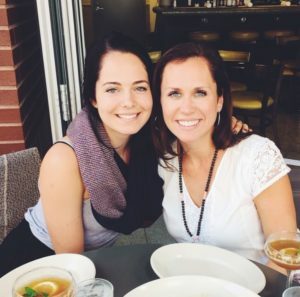 I have recently reunited with my daughter, who is now 22. I thought my heart would explode seeing her face again. It made me truly realize any shame I had ever felt was all self-inflicted – it was never honest or real. The most painful, earth shattering period in my life has brought me so much humility, love, compassion, understanding and grace. Which is her name…Grace. Coincidences are mislabeled miracles, right? The risk of being authentic and truthful is worth the reward of living a fully lived life.